Of course, Parliamentarian Udaya Gammanpila is the founder President of ‘Pivithuru Hela Urumaya.” (PHU). Mind you, it is simply ‘pivithuru,’ or pure. The party he was in before was The Jathika Hela Urumaya (JHU). He, it can be logically inferred, left the JHU to form the PHU because the JHU wasn’t the pure form of the Platonic Universal which lies somewhere in transcendent realty. In other words, the JHU was a poor shadow of the Sinhala Buddhist nationalism that exists as a universal somewhere in a reality beyond the reality that one can empirically feel and touch and see. On the other hand, in the case of Gammanpila he has been able to download the very Platonic Universal itself. That is for a bit of philosophy. What we remember is how exactly Gammanpila left the JHU in the dark secret night having sworn to the hierarchy the evening before that he will never even think of deserting the party that had delivered a Parliamentary seat to him. And that wasn’t even after eating hoppers. Gammanpila simply swore without the hoppers. He retired home and announced the following day he is forming the pure thing. He is always pure-appearing in pure white clothes taken from a wardrobe full of pure whites. When his former colleagues of the JHU including, his bosom pal Patali Champika Ranawaka, expressed shock at Gammanpila’s turnaround like a trapeze artist, our friend PHU didn’t bat an eye lid. He walked with his head high and shoulders erect as though nothing in the world had happened. Here is the key to Gammanpila’s deceitful conduct: An air of supreme confidence. The Chinese Philosopher G. Chan once said that an air of confidence helps a liar to get away with his lying. Gammanpila has mastered that art. You cannot catch him looking guilty. Now, Gammanpila knows he was lying, again. This so-called sale of land to foreign investors was done prominently and sans immunity by the former regime in which he was Minister. Valuable blocks of land in Galle Face, Colombo Port and even in the jungles in the sacred Somawati precincts had been “sold,” like this by that government. Gammanpila said nothing in protest because he knew this is really not the sell-out that he talks of now. Governments giving blocks of land to foreign investors on a 99-year lease is a well-worn economic strategy. “99-year,”is a technical arrangement to entice the foreign investor to dump his investment with confidence. The Chinese Government would not take over a large block of land in Hambantota or anywhere for a short period. The “ninety nine years” has become a standard period for acceptance all over the world. Of course government can take back the lease before that on condition of paying compensation. Hence, this kind of arrangement isn’t anything like selling Sri Lanka. As a matter of fact, two years ago the Australian Federal Government gave a ninety-nine year lease of land in Darwin to a Chinese Company for investment. If anybody were to protest over issues of this kind it certainly cannot be a Minister of the Rajapaksa Regime. To find Mahinda Rajapaksa hiding and planning the invasion of protestors isn’t surprising since Mahinda is a moral sceptic and Machiavellan. He at no stage ever appeared as a statesman. He cannot. And what do you think of Gammanpila bringing out the image of the Dalada Maligawa and Anuradhapura Sri Maha Bodhiya? Sri Lankan politicians cannot get out of the rut of using religion in their power machinations. Persons in robes are huddled up and rushed in at will. I purposely refrain from naming them “monks,” because they very well may not be. Is this the work of the Pivituru types who are supposed to be there to save the Buddhist Sanga? 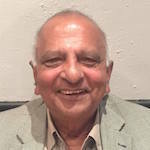 When the MEP was formed in 1956 under the leadership of SWRD Bandaranaike who donned pivithuru clothes monks were heavily employed to get on to stage and shout that the nation is in danger. It was really and ironically SWRD who was in danger as he was shot and killed by a monk after he came to power. Monks who enter the political arena enter a political power game. Their power lever is the Buddhist robe. 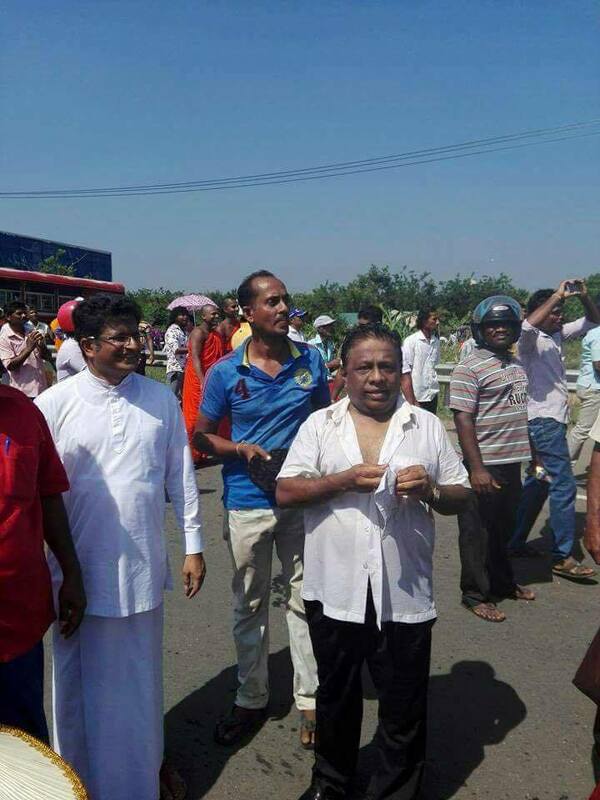 Being pivithuru, Gammanpila should distance himself from moves like this. In the case of Hamabantota, the police had been prepared to allow shouting and protest behind legitimate barricades even though there was a court order prohibiting public protest for this special occasion. However, monks were pushed forward along with lay people to try and break barricades and invade the meeting area where foreign dignitaries were. This entitles them for a share of tear gas along with the rest of the mingling crowd. Tear gas is not life-threatening; it is merely temporarily disabling mischief makers. It is heartening relief to find that there were no deaths. Yet, knowing all this, Gammanpila and his fellow MR-backers condemned the Yahapalanaya government as being dictatorial and undemocratic. Once again, anybody is entitled to criticise the government as being undemocratic; but in all honesty not the former Ministers of the Rajapaksa government. The list of undemocratic acts of that regime are so legion that it is tedious to list them.